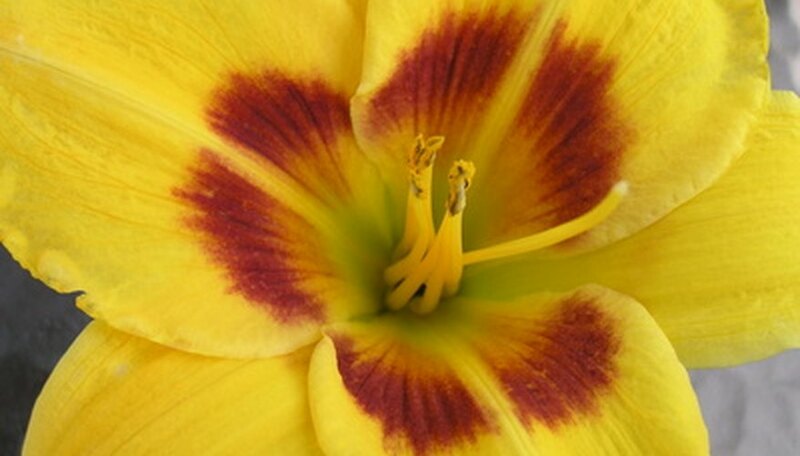 Daylilies are hardy perennials that do best in full sun and well-drained but moist soil. They grow in a wide range of climates and are hardy to USDA Plant Hardiness Zones 3 to 9. Deciduous and semievergreen varieties protect themselves by dying back to the ground. The evergreen varieties stay green until the leaves are killed by a freeze, exposing the crowns of the plants to possible cold damage. While these types are definite candidates for a winterizing regimen, all varieties of daylilies will fare better by extra care before winter arrives. Keep your daylilies hydrated in the fall if the weather has been dry. Daylily Meadows, a nursery in North Carolina, recommends supplementing with water right up until winter begins. A plant kept too dry will not be in optimum shape to deal with winter stressors. Stop watering the plants when the ground freezes. Examine the leaves for evidence of fungal diseases such as leaf spot. Remove any affected leaves and dispose of them in the trash bag to guard against reinfection the following year. Daylily rust, a highly contagious fungal disease, doesn't usually live through the winter in colder climates, but many gardeners prefer not to chance reinfection and dispose of affected leaves and stems. Leave the healthy green leaves on the plant. According to Arcadian Daylilies, a nursery in Canada, daylilies will continue to grow if their leaves are still green. Evergreen daylilies will continue this process up until their leaves are frozen. For added winter protection, don't remove the brown leaves of the varieties that go dormant. Add fresh soil around the base of your daylilies if the plant has started to heave out of the soil. Winter mulching will help with mitigating the effects of thaws and refreezes. Mulch with straw or crushed leaves to about 3 inches after the ground freezes. Newly planted daylilies benefit from a thicker mulch. Daylilies perform best when they're divided every 4 to 5 years. Keep your daylilies healthy. Daylilies that survive the winter successfully have a good foundation of care during the growing season. Check local gardens and arboretums for which daylilies are growing successfully in your area to aid you in choosing varieties. Remove any weeds growing near your daylilies. Some weeds are themselves perennial and may grow within the daylily clump and be hard to eradicate. Don't add soil too high above the crown of daylilies whose roots have heaved out of the ground. This will affect growth and flowering for the next year. Daylily rust causes orange pustules to appear on the leaves and stems, along with yellow streaks on the leaves.